This poor tree has been vandalised at least three times since the tree was planted in 2015. Council did put up a small sign saying that it had been vandalised, but this was not a deterrent. 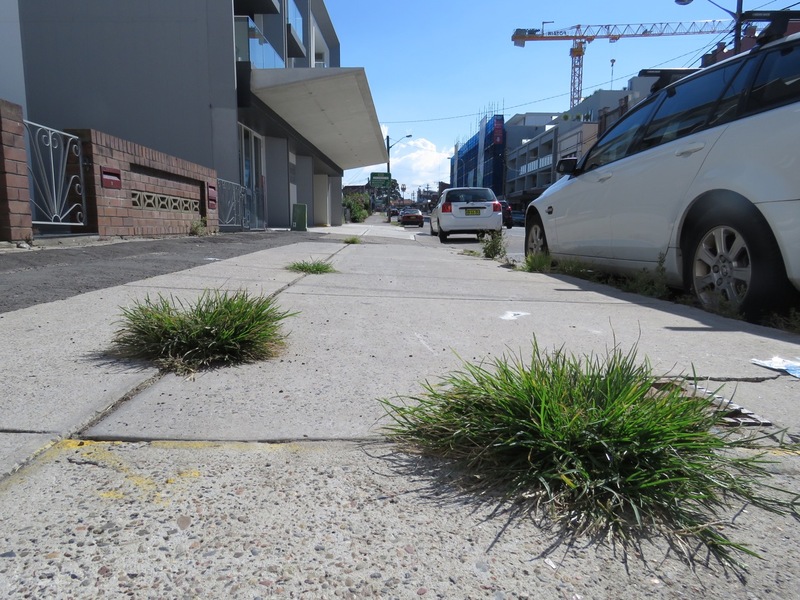 The Inner West Council planted a street tree in a pocket of grass in Myrtle Street Marrickville. A tree was much needed at this location because it is bare & dare I say ugly. I was very happy they planted at this location. Then the tree had several branches snapped off. The tree grew more branches & the tree was vandalised again. I started to doubt that this was a random act. The tree’s desire to live was strong, so it grew some more & started to look strong & lush. I went by the tree today & its leaves are dry & crisp. Its thin branches are still alive showing that whatever was done to this poor tree happened recently. Unfortunately, this tree is dying. To me it appears that some sort of chemical was fed to it to make sure this determined tree would not rise up again. It is beyond my comprehension why people rob the community & the wildlife of street trees. One tree may not matter much, but we have an urban forest classified as ‘poor’ in terms of percentage of canopy cover. We need trees just to break even in terms of the norm in Sydney. We also need trees for good public health & we desperately need trees in terms of climate change. 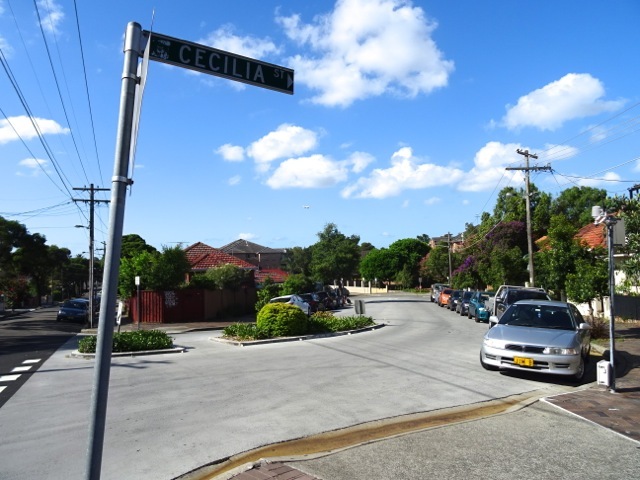 We need more trees in Marrickville & throughout the old Marrickville municipality. We need bigger, more shade-producing trees. 1.1°C may not seem much, but you only have to have been in Sydney this past month to experience what a heatwave feels like. Heatwaves & extreme weather events are all part of this global rise in temperature. The Arctic is the warmest on record, sea ice is melting at alarming speed, coral reefs are bleaching, the oceans are heating up…. There is more, but you get the picture. We cannot keep relying on air-conditioning. One day there will be too many of us using too much power for the system to cope with & we won’t be able to turn on the air-con. Then people will die. Perhaps thousands of people. Death in numbers like this has happened many times before. We won’t be able to easily acclimatise to the heat either. The following is part of a summary of research titled, ‘Limitations to Thermoregulation and Acclimatization Challenge Human Adaptation to Global Warming’ published in 2015. They knew then that it will be difficult for the human race to adapt. Thousands of us are likely to die in each heatwave event. That will be a devastating experience for many. I hope the Inner West Council plant another tree at this location. 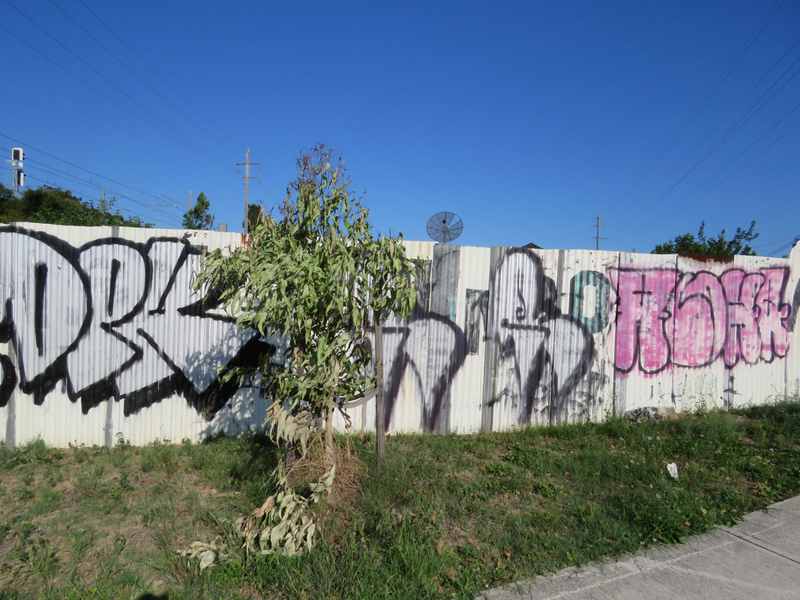 Tree vandals cannot be the deciders on how the rest of the community live, their health, the level of pollution they live with, their ability to have a beautiful suburb, how cool their streets are or whether the wildlife can have habitat & food. The culture must change. The streets belong to all. As I post this I am listening to the weather forecast on the TV news. They are forecasting a heatwave two days from now on Tuesday. That will be the third heatwave for Sydney in 2017 & it is only January. I’ve just discovered a great learning resource for anyone interested in climate change, that I think will be especially useful for teachers. Called HIPPOCH, it explores the ‘HIPPO phenomena.’ That is habitat destruction, invasive species, pollution, population & overharvesting & breaks this information into short lessons. Climatic effects of climate change. Each lesson comes with full information, easily adaptable for teachers. There are maps, diagrams & short videos. I read a lot about climate change, but came across information that was new to me. 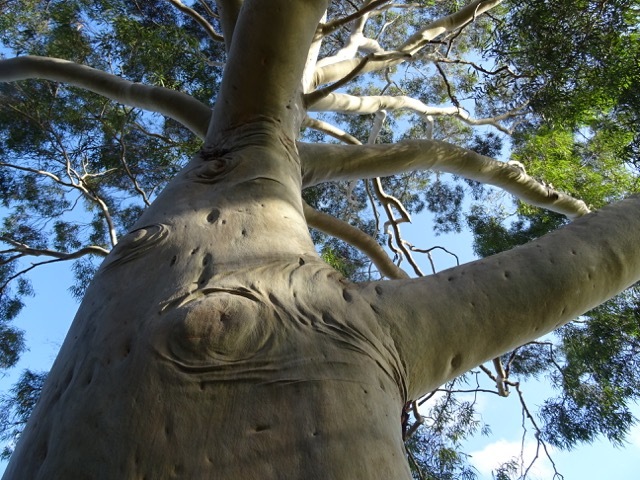 Stunning Eucalyptus street tree in Hurlstone Park. Trees will become immensely important as climate change progresses. In Australia this day could pass you by because there isn’t much happening. What I think is important to think about on this Earth Day is climate change because it is moving at an unprecedented rate with scientists thinking that it is too fast for ecosystems & humans to cope & adapt. The National Oceanic & Atmospheric Administration said that, “for the 11th straight month, the globe was record warm” with March 2016 the warmest March in recorded climate history. Scientists from Australia’s James Cook University, University of Queensland & the National Oceanic and Atmospheric Administration Coral Reef Watch Program found that sea temperatures are rising so fast that corals cannot cope leading to severe bleaching. See – http://bit.ly/1QrjhB1 The Great Barrier Reef is in real trouble no matter Greg Hunt the current Environment Minister’s optimism. Coral reefs in the northern hemisphere are also experiencing bleaching. See – http://bit.ly/1T2uw4L It is important to note that about one billion people rely on coral reefs for their food. In March 2015 atmospheric carbon dioxide levels at Mauna Loa were 401.52ppm. Just a year later in March 2016 they had risen to 404.83ppm. In April 10th 2016 atmospheric CO2 levels reached 409.29ppm. I remember when 350ppm was deemed the upper safe limit of atmospheric carbon dioxide levels. That seems like a dream now. The Australian Museum says “An average temperature rise of 2°C may result in the estimated extinction of 20-50 per cent of the world’s species by 2030. If this current trend continues, the figure could reach 50-60 per cent by 2100.” See – http://bit.ly/1TmfJEz Stop reading & imagine that just for a moment. Finally, what is Australia doing about it? The Climate Change Performance Index for 2016 is an interesting read. Unfortunately, it shows Australia’s performance is “very poor.” We rank last at number 59 for OECD member countries & third last at 59/61 countries for the Climate Change Performance Index performance rating. So do we sit back & wait for the end to come? I don’t think so. Even though the bulk of emissions in Australia are caused by industry, we can create change by voting with our wallet & taking simple actions to lower our carbon footprint. Buy only sustainable products & ignore those that are not or have excess & unnecessary packaging. Stop using plastic bags & carry your own bags to the shops. Switch off lights when you leave the room. Turn off appliances when not using them. Wash clothes in cold water. It’s just as good. Try not to waste water. Wash up or use the dishwasher only when full. Hang your washing out to dry instead of using the dryer. Install solar power when you can afford it. Install a solar-powered hot water system as well. 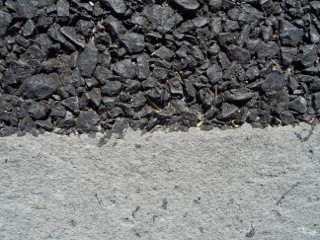 Reduce air leaks to seal in heat or cool air in your home. Draw the curtains to keep out the hot sun. Choose your energy company wisely. Reuse & recycle as much as possible. Walk, use public transport or cycle as much as you can. Drive smoothly when in your car. Keep your car tyres fully pumped up. Travel locally without getting on a plane. Clean your air-conditioning filter regularly. Use air-conditioning & heating only when necessary & set the thermostat a couple of degrees higher for cooling and a couple for degrees lower for heating. A jumper or a quilt helps one to keep warm. 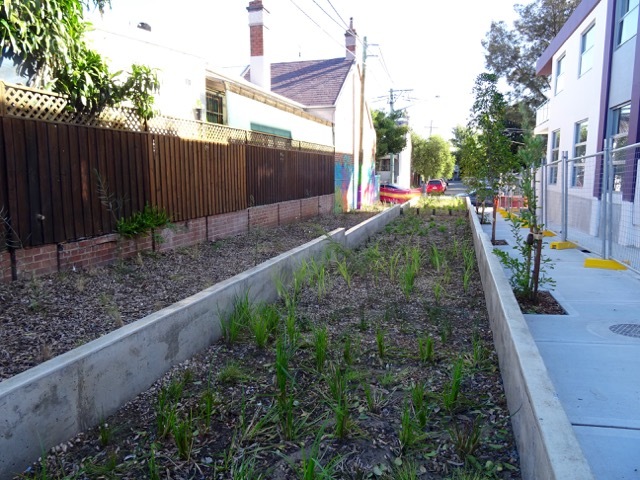 Start a verge garden to help cool the street. 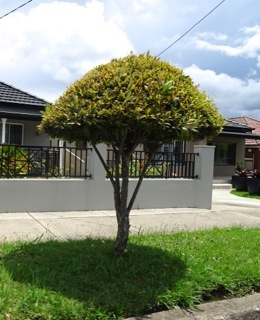 Plant a tree or shrub on your property if you have the room. Get involved in local events to green up the area. 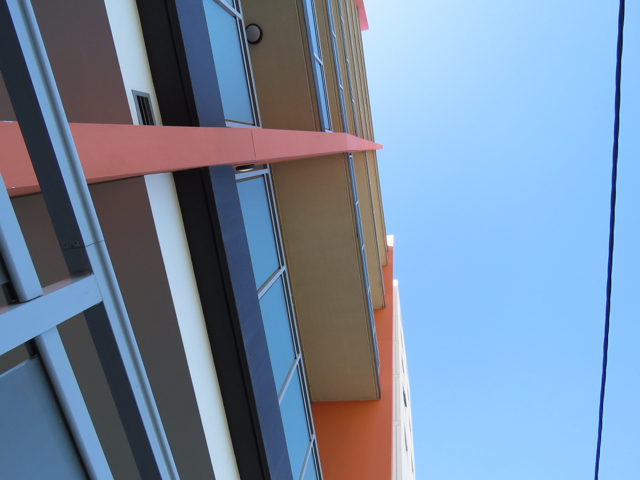 Lobby local councils to force developers to design green apartment buildings. Lobby local councils to significantly increase the urban forest. Lobby our governments to take meaningful action on climate change. Remember, every change or action we take we are doing it for future generations. Our children, grandchildren & their children deserve an earth that is hospitable. We cannot be the last generations that failed to do something. Life on earth is far too important to ignore. The planet can survive without human beings, but it would be far better if we did not push the situation so far that we caused our own extinction. Kookaburra in the grounds of Newington College Stanmore. 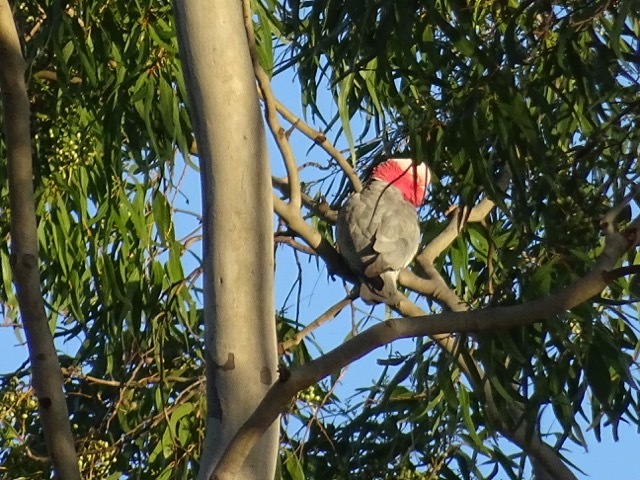 A Galah – Nearly half of 200 Australian species are threatened by climate change. Warning: This could be depressing reading for some. I have posted about this report as I believe climate change is an issue that we cannot afford to ignore, even if what the scientists & researchers predict is scary. The US Global Change Research Program has released ‘The Impacts of Climate Change on Human Health in the United States: A scientific Assessment,’ which looks at how climate change is affecting human health & the changes that may happen in the future. Reading through this document it is easy to see how the changes can be similar for Australia. The researchers believe heat-related deaths will increase, especially in children, the elderly & economically disadvantaged groups. The researchers expect “…an increase of thousands to tens of thousands of premature heat-related deaths”, however, tolerance to extreme heat is expected with the increased use of air conditioning. So we will be stuck indoors & hoping the power stays on without a problem. The Australian Bureau of Meteorology said that March 2016 was the hottest March on record & the 2nd March was Australia’s hottest day on record. Two records broken in the same month! Wildfires are expected to increase, again negatively impacting air quality & “increasing the risk of premature death and adverse chronic and acute cardiovascular and respiratory health outcomes.” Bushfires are a major threat in Australia. Asthma & allergic illnesses are expected to increase. Increases in extreme weather events are expected such as drought, flooding the frequency and/or intensity of drought, wildfires & hurricanes. We can expect similar in Australia. “Climate change is expected to alter the geographic and seasonal distributions of existing vectors and vector-borne diseases.” These are mosquitoes, ticks & viruses like Malaria & Dengue Fever. Some may be new, some may resurface & their impact will be up to the human population in how they control them, as well as how well they protect themselves. “Increases in some extreme weather events and storm surges will increase the risk that infrastructure for drinking water, wastewater, and stormwater will fail due to either damage or exceedance of system capacity, especially in areas with aging infrastructure.” A couple of years ago I read that Marrickville municipality’s aging stormwater & sewerage infrastructure is at capacity & this is before the significant increase in population planned. The recent report ‘Climate Change, Global Food Security, and the U.S. Food System’ found that “climate change is very likely to affect global, regional, and local food security by disrupting food availability, decreasing access to food, and making utilization more difficult.” See – http://1.usa.gov/1OxfV3c So we will be hot & hungry. Atmospheric carbon dioxide reduces the concentrations of protein and essential minerals in most plant species affecting food staples such as wheat, rice & potatoes. Rising sea temperatures is expected to increase mercury levels in seafood. “… populations of concern, include those with low income, some communities of color, immigrant groups, Indigenous peoples, children and pregnant women, older adults, vulnerable occupational groups, persons with disabilities, and persons with preexisting or chronic medical conditions.” That’s a lot of the community. As I interpret it, you have a better chance at managing & adapting to climate change if you are a young adult, have no health issues or disabilities, are not Indigenous or an immigrant, don’t work outdoors, have a secure & sufficient income & lastly, not pregnant. This may be pretty shocking & somewhat overwhelming, but we as individuals can make changes to our lifestyle choices that have a significant impact, particularly if enough of us do it. Australia’s level of consumption & ecological footprint needs 4.8 planet Earths. We are ahead of the United States of America who need just 3.9 planet Earths. See – http://bbc.in/1Sk4oE5 Today 6th April 2016 the resident population of Australia is projected to be 24,037,142, while the USA started 2016 with a population of 323,572,160 almost 13.5 times greater than Australia. The bottom line is that human beings cannot keep on living as though we have infinite resources without getting an enormous payback from the planet & unfortunately that payback is at its minimum, lots of suffering for people, & at its worse, partial or full extinction & I am not including non-human species here. We have to wonder whether we are actually destroying that which keeps us alive. To end on a positive note, I believe that we can stop runaway climate change, but we all need to work together & start now. The Cooks River Valley Association is once again holding their ‘Floating Candles’ event to celebrate Earth Hour. Earth Hour was started in 2007 in Sydney with people turning off their lights for one hour. Twelve months later it became a global event. 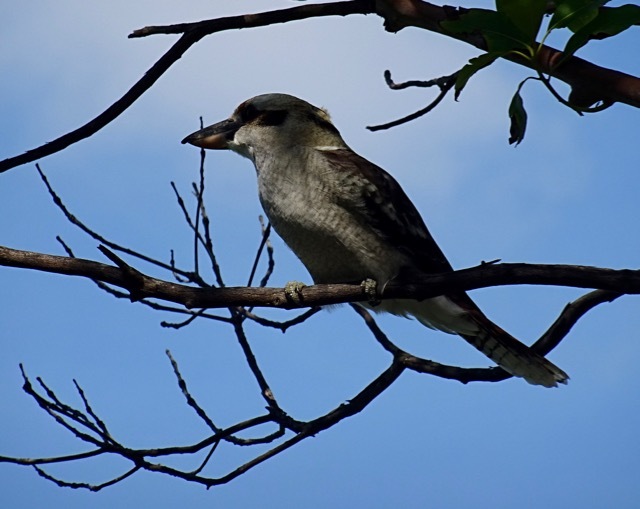 The Cooks River Valley Association will be holding Earth Hour in Kendrick Park Tempe & local group ‘The Hungry Trio’ will be playing live jazz. You are asked to bring chairs or blankets, a torch & a paper boat, plus your picnic dinner. I’d recommend some mosquito repellent also. 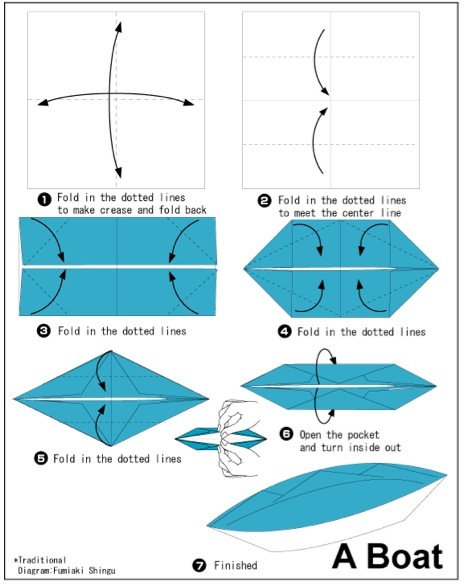 You can also bring your own paper boat, which will be dipped in wax to make it waterproof. Candles to go into your paper boat will be supplied. The River Canoe Club will be out on the water to collect the paper boats after the event, so the boats will not be left to add more pollution to our river. WHEN: this coming Saturday 19th March 2016. 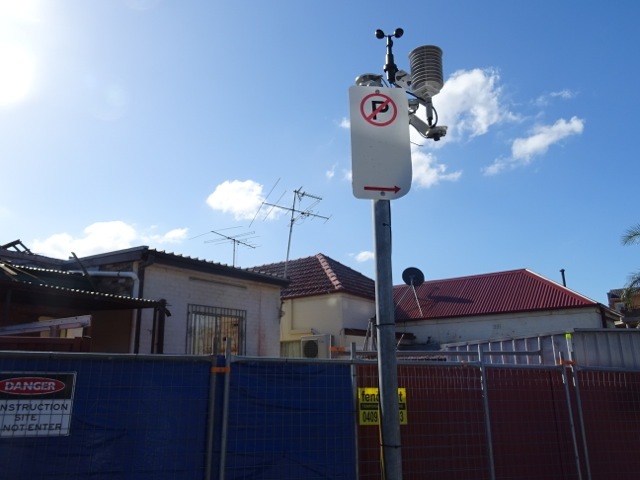 PARKING: There is parking in Kendrick Park, but not much, so either ride your bicycle or park in the Tempe Railway Station car park & walk down the path to Kendrick Park or in Holbeach Avenue Tempe & cross the Princes Highway at the lights. 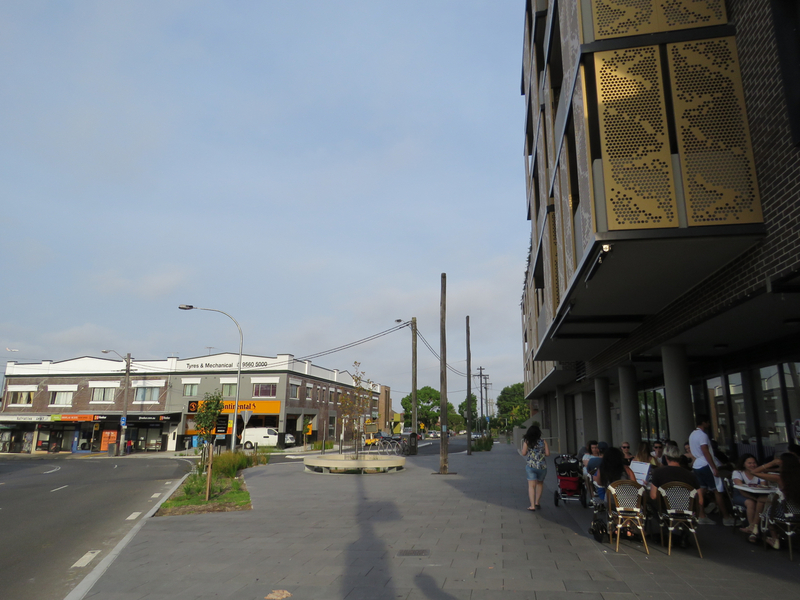 Marrickville streetscape – photo taken last week. There was more concrete behind me. Finally the urban canopy is being acknowledged as a health issue! Recent research has found an increase in respiratory & cardiac illness with more fatal cardiac arrests in areas with a poor canopy. Add increased depression & obesity & you have an unhealthy, unhappy community, which ultimately has a cost on all of the community. Unless there is a change of culture, I believe these problems will only increase with the current trend of high-rise housing with little or no green space or access to peaceful green space, as many of our parks are being transformed into entertainment areas. Therefore, an Australia-wide initiative driven by the federal government to increase the urban forest canopy can only be applauded. We can have high-rise & green space. Green walls & green roofs can be incorporated into new designs just as easily as a pool for example. The federal government’s announcement might be alarming for those state governments which are removing trees at a fierce rate in the push for development. In Sydney alone 400 trees, many of them large Fig trees that are iconic to Sydney are being removed in Randwick for the eastern suburbs light rail project. This is despite Randwick Council saying that the light rail line can travel the same route without removing the trees. A whopping 760 trees will be removed along the entire light rail route. The NSW government’s response to criticism about the tree loss has been that eight new trees will be planted for every tree removed. Sounds good, but I will watch with interest at what species of tree is planted, how many survive & what the canopy looks like in a decade. I highly doubt the canopy will ever look like it did in the beginning of December 2015. Even closer to Marrickville LGA is Sydney Park at St Peters where 350 trees are being removed to establish a construction depot for the WestConnex Motorway. See – http://bit.ly/1OpHg63. It seems that trees & green spaces are fair game for development, even when there are other options. Bushland at Wolli Creek is also threatened for WestConnex. The most expedient & cheapest way is to remove trees, yet the impact of doing so has far reaching consequences on both the community & the wildlife. Then there is the 10/50 Code that allows for any tree to be removed within 10-metres of a home & remove underlying vegetation within 50-metres of a home without seeking approval because of bushfire risk. The North Shore & Pittwater areas of Sydney have been losing trees like they have no meaning. The 10/50 Code offers a giant loophole for landowners to remove trees for any reason they like & according to Lane Cove Council, bushfire risk in the area is minimal. Still their urban forest has been decimated. Globally 2015 was the hottest year since records started. 2011 to 2015 have been the hottest 5-year period world-wide since records started. 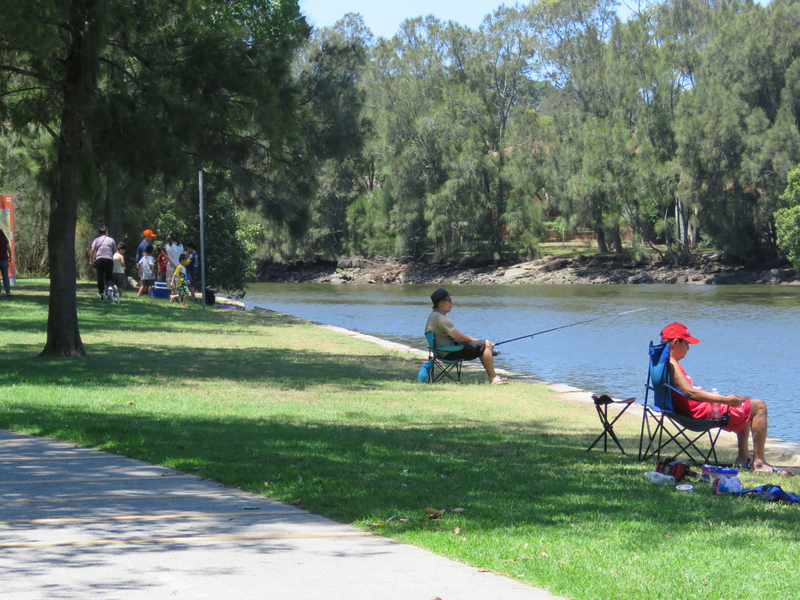 Sydney is expected to be like living in Rockhampton in subtropical Queensland by the turn of the century. See – http://bit.ly/1DM40tk Therefore, what is planted also needs to be taken into consideration if local councils want the trees to survive more than a few years. Part of greening our cities, which also includes suburbs, requires a culture-shift of the community itself. 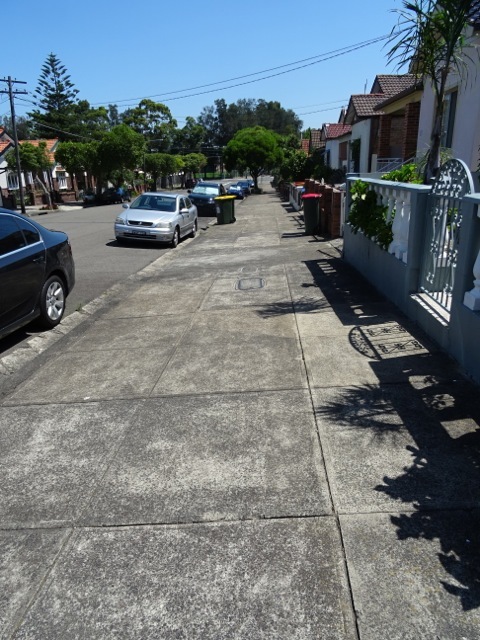 Many areas of Sydney are defined by their trees – the North Shore, Pittwater, Eastwood area & Sutherland Shire as examples. Then there are suburbs with few trees, both public & private. I think it may be a battle for a while until the prevailing attitude towards trees changes. To change public perception of trees, the government will need to embark on a strong multi-media education program. Twice in the past week I passed individuals in Marrickville who were casually pruning street trees into small stumps with no canopy. That they do this in broad daylight shows that they believe that it is their right to do so & that they have little care or no conception that the street tree belongs to the whole community. With luck, tree vandalism will become a rare occurrence, street trees will be planted in better conditions & the community will embrace the care of the tree by watering it while it is establishing & also during dry periods. What will be wonderful in my opinion is that large canopy trees will become the norm because it is these trees that provide the most benefit & utility in cooling the streets & also in carbon sequestration. It is also these types of trees that the federal government is talking about. I will be very pleased to see spindly street trees only used in spaces where there is no room for anything larger. I will also enjoy the resultant beauty along our streetscapes when trees become more of a feature than buildings & where landscaping is used more often than concrete. Green walls & green roofs will be wonderful as well. Lastly, greening our suburbs will bring wildlife in & support wildlife already here. Instead of the constant noise of traffic & planes, we will listen to white noise of bird song during the day & crickets & frogs at dusk. I know this to be true because the simple addition of some native trees & an under-storey has brought much wildlife to out place, whereas it was almost bereft when we moved in. We have to change as individuals & as communities. Local Councils need to change as well. Much needs to be tossed out of current tree policies if they do not support increasing the canopy or the tree species chosen & placement does little to lower the urban heat island effect. I suspect local councils will rapidly get on board with federal government directives, but I fear some in the community may find it hard to embrace an environment full of trees. We all have much to gain from a greener environment, from large canopy trees, to areas of under-storey filled with shrubs & plants & grasses & from being able to walk around without dashing from patch of shade to patch of shade. Climate change will demand that everyone cooperates with the greening of our cities or we will suffer, cause our community to suffer & make it unlivable for future generations.